Will Nifty Futures Pullback to make New High? You are here: Home / Futures and Options / Will Nifty Futures Pullback to make New High? Nifty Futures opened gap down and made a island reversal pattern on Monday. Though it is a classical bearish pattern,markets generally reacts against the classical technique most of the time. Trading Sentiment is negative and after the Monday’s impact on markets expectation on the psychological figure 9000 reduced. Is the Markets Tired? Yes We are in a Emotional Buyers Market which makes the market tradeable but doesn’t suit from the investing view point as the Markets are dominated by shorter timeframe buyers and sellers hunting each other stops and colliding with each other in September series. Currently shorter timeframe sellers are in control and the recent down move looks like more of long liquidation and to remove the weaker shorter timeframe buyers who anticipated the psychological level. Since the drive is more of shorter timeframe sellers behavior and their inventories are piled up one can expect their stops to be hunted in upcoming trading sessions. 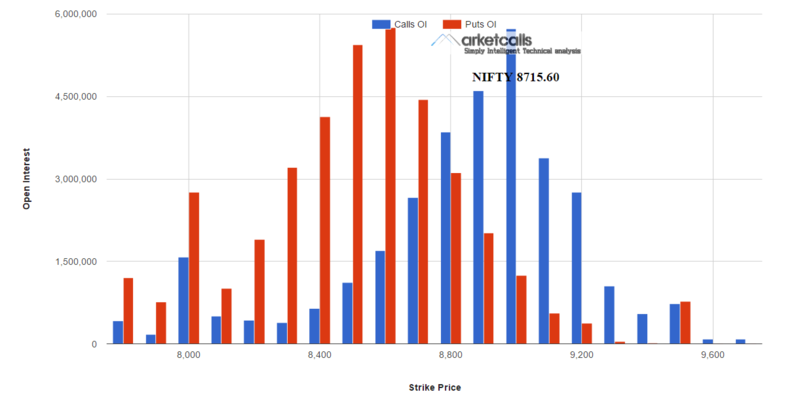 From the Open Interest Point this expiry market is expected to move in a narrow range 8600-9000 as both put and call writers are active in those zones. Volatility increased on Monday trade India VIX is at 15.24 up by 15%. Volatility is like a energy drink which is much more required to get some momentum in the markets and it makes all the trading participants active and makes exotic price movements and brings bizarre and unexpected swings. Stops have to widen as volatility increases substantially and the trading quantity has to be reduced as the swings are quick and wide. Nifty Futures – Short Term View – 16th Apr 2019 Nifty futures so far in April series moving a very narrow range and 10 day ATR is around 110 levels and volatility is on the falling side. Nifty Futures – Extreme Positive Sentiment Nifty currently trading around 11521 in Nifty spot making a one-way rally straight away from 10580 levels made during 19th Feb 2019. Nifty Futures at Critical Resistance Level – March 2019 Outlook Nifty is spending in a broader consolidation range for the last three months in the band of 10600-11000 levels. Now its been nearing critical Quickflip resistance level 10960 on the hourly timeframe.